When you remodel your kitchen, you want the room to look different than it did before you began the project. 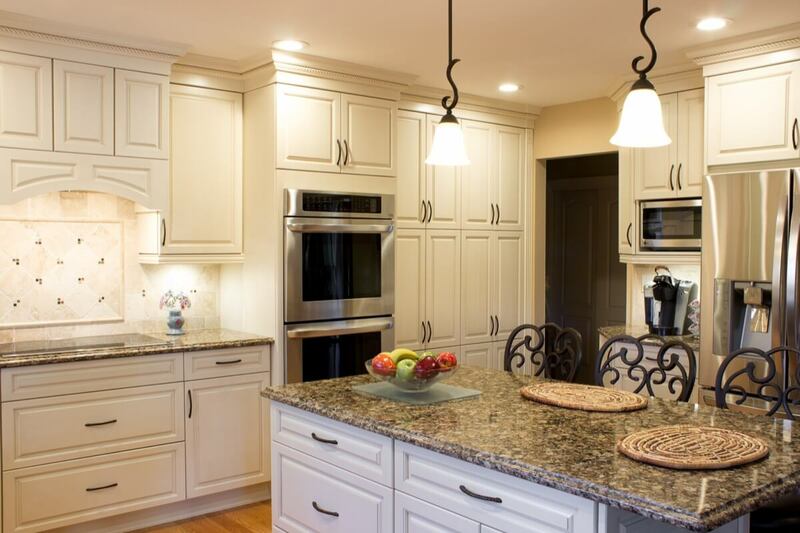 Changing the layout of your cabinets is one of the best ways to accomplish that goal. No matter the size of your kitchen, you have options about where to place cabinets and how to use the available space. 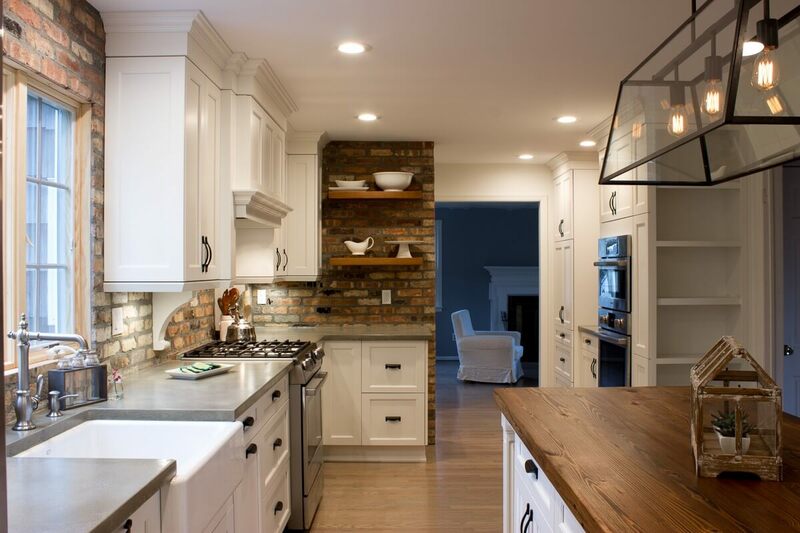 The following kitchen cabinet layout ideas will help you brainstorm ways to make the most of your storage space during your next remodeling project. If you have a collection of heirloom dishes, show them off in a cabinet with a glass front. Glass doors are especially nice in kitchens with cabinetry in a light finish, such as ivory or gray, because the items inside can be used to add a pop of color to the room. In this East Northpoint kitchen, the glass cabinet serves as an eye-catching element in the corner of the room. 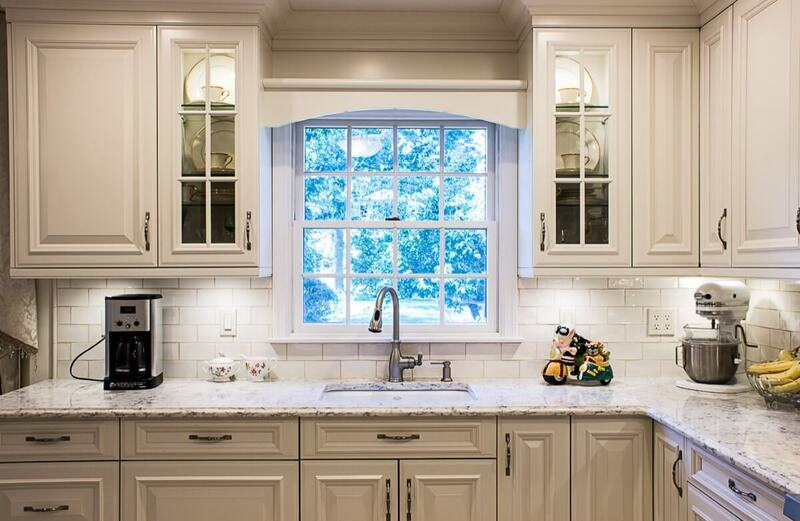 As another option, consider framing your kitchen window with complementary glass cabinets on either side of it, like we did in this Manhasset home. Cabinets aren’t only for the kitchen; you can also line the walls of your dining room or your breakfast nook with storage space. To give the two areas complementary but separate looks, use matching cabinet styles in contrasting colors. 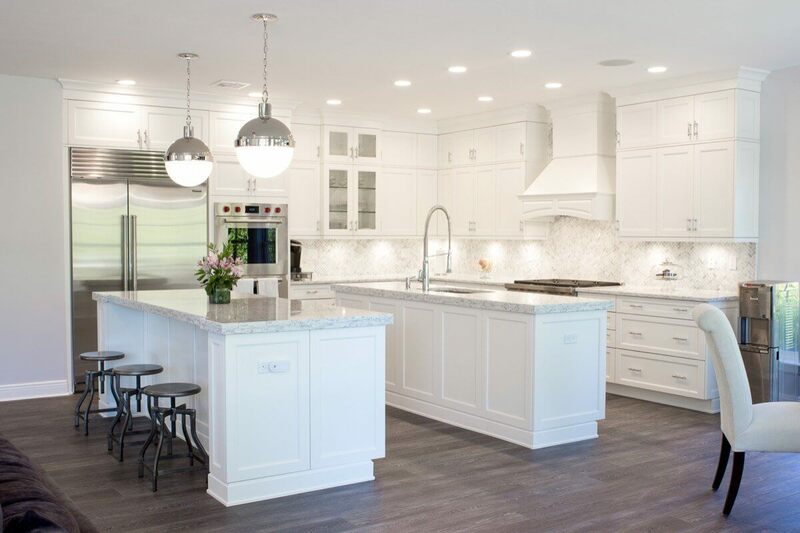 In this Baiting Hollow home, we used white for the main kitchen cabinets. The island, however, features dark wood, which ties into the dark cabinets on the walls of the adjoining breakfast nook. Especially in small kitchens, it’s important to put every square inch of the room to good use. False cabinet fronts and blocked-out segments serve only as wasted space. Instead, fill narrow gaps and small openings with specialty drawers and cabinets. You might find the perfect spot for such storage next to one of your kitchen appliances or at the end of a row of cabinets. 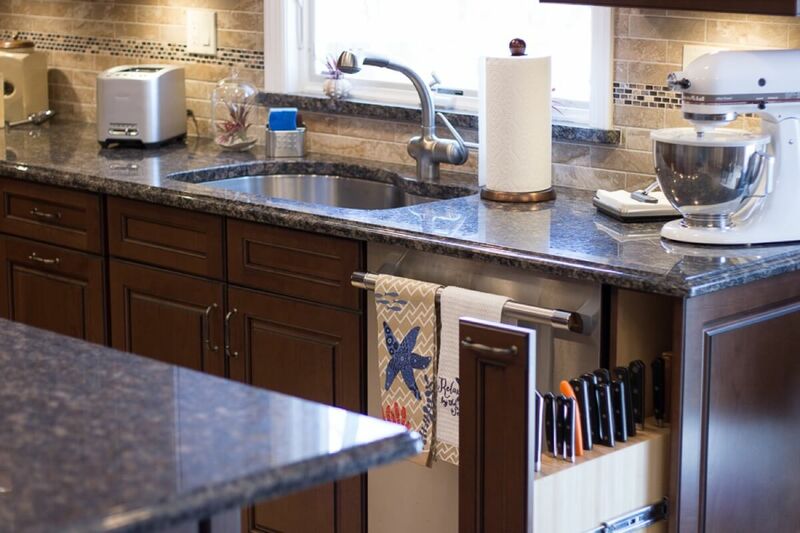 In this Centereach home, we included a slim pull-out cabinet with a built-in knife block. 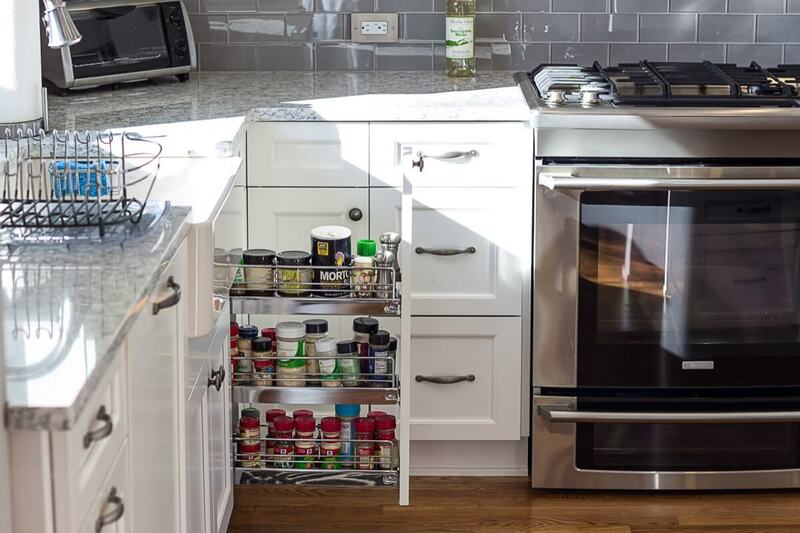 This Commack kitchen hides a narrow pantry drawer for canned goods next to the sink. 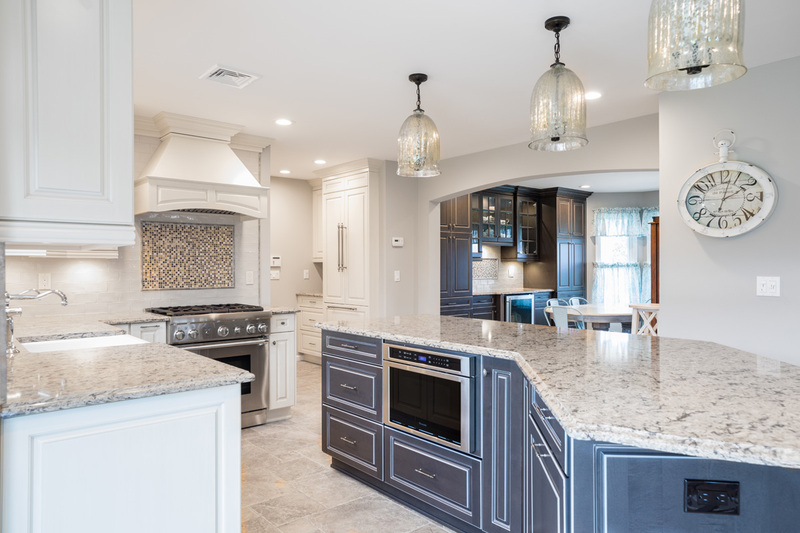 Your kitchen may have a pass-through that connects it to an adjoining living or dining space. Cabinets above this window can make the area look cramped, so it’s often a good idea to take those out during your kitchen remodel. If you’re worried about losing storage space, consider adding just one hanging cabinet in the opening, as in the Saint James house below. This cabinet serves as a decorative element because the double-sided glass doors allow you to view the beautiful contents from either room. If you want to include as much storage space in your kitchen as possible, then you need to include high cabinets in your layout. While items that you use daily or weekly should be kept in cabinets or drawers that are no higher than eye-level, high cabinets are just right for the items that you use only every once in a while. 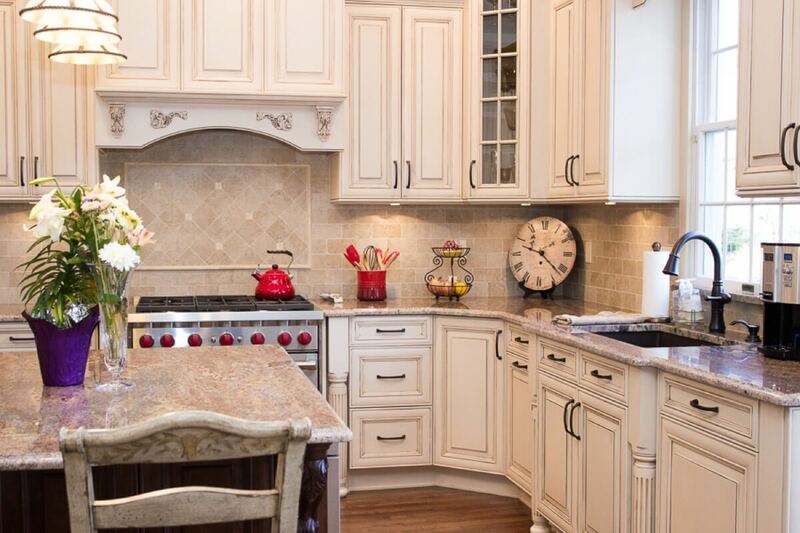 This Nesconset kitchen is a stellar example of including high storage throughout the room. There are high cabinets above the oven, the microwave and the refrigerator, and a pantry wall extends all the way up to the ceiling. High-end kitchen designs often include an integrated dishwasher. With this approach, the appliance is fully or partially concealed from view. This is a nice touch in any kitchen, but it’s especially popular in kitchens that are visible from other rooms in your home. 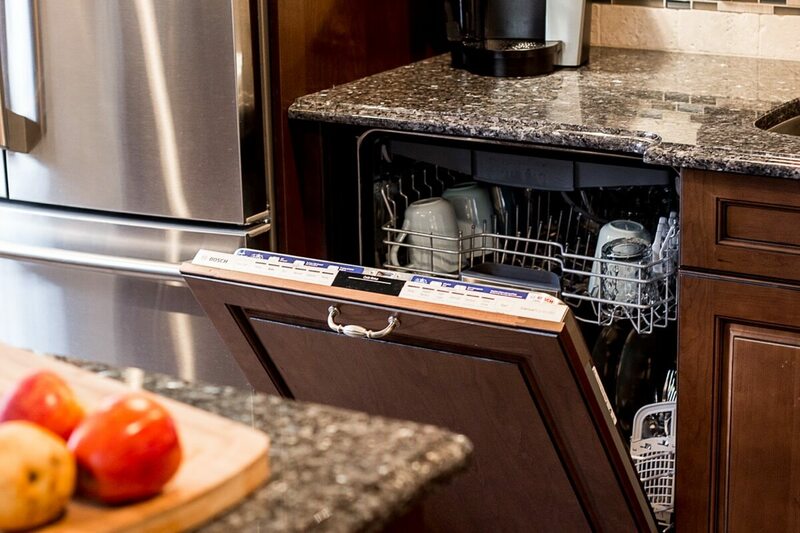 Installing a custom-built cabinet front for the dishwasher is a popular way to hide this appliance. Below, you can see how we integrated the dishwasher into the cabinet layout in a Sayville house. In addition to hiding your dishwasher, you might also want to use cabinetry to conceal the hood over your range. The hood will disappear from sight when you cover it with a wood panel in a matching finish. False cabinet fronts on the panel will help it blend in even more. 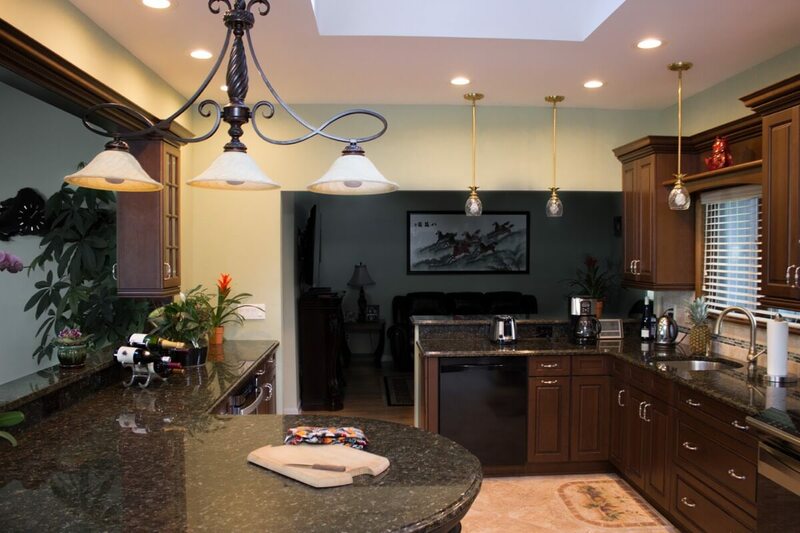 To keep this area from being wasted space, we added a small shelf for this Smithtown kitchen. The shelf serves as a perfect display spot for a few decorative items. 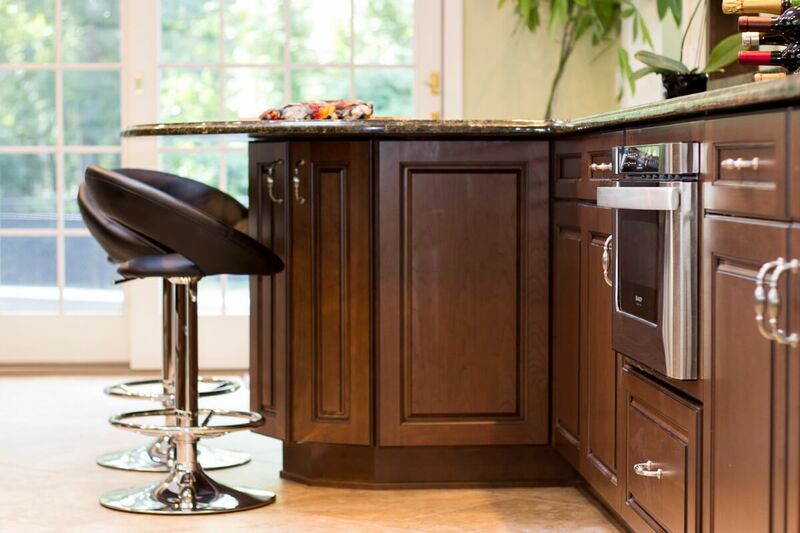 It’s not uncommon to place cabinets in a kitchen island. Many islands, however, confine the cabinet doors to only one or two sides of the unit. The resulting cabinets are large and deep, which can lead to clutter and an inefficient use of space. To help you stay better organized, consider putting an assortment of smaller cabinets all the way around the island. As you can see in the photo below, we even added cabinets on the barstool side of the island in this Saint James kitchen. Many kitchens have one upper row of cabinets and one lower row. However, if you have high ceilings, confining yourself to this traditional approach can leave you with wasted space between the cabinet tops and the ceiling. 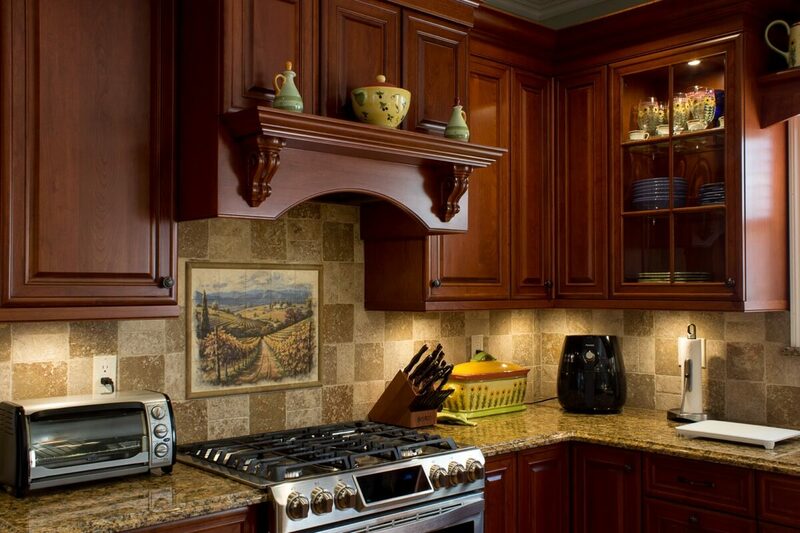 Instead, opt for two stacked rows of upper cabinets that extend to the very tops of the walls. As you can see in this Saint James kitchen, when the doors of the stacked cabinets align with one another, the finished room feels clean and organized. Open shelving is a hot trend in kitchens right now. This design style can lend the room an open, airy feel, and it’s a great way to display your favorite dishes or collectibles. To embrace this look, you don’t have to ban cabinets from your kitchen entirely. Instead, create a striking focal point by including just a few open shelves in your design. Notice what a statement is made by the pair of open shelves in this Port Jefferson home. Have these kitchen cabinet layout ideas given you inspiration for your next remodeling project? You can incorporate one of them into your design plans or use a combination of several ideas. If you’re ready to get started with a 3 Week Kitchen Renovation, contact us to schedule a free consultation.